The United States Congress designated the Caribou Wilderness (map) in 1964 and it now has a total of 20,839 acres. All of this wilderness is located in California and is managed by the Forest Service. The Caribou Wilderness is bordered by the Lassen Volcanic Wilderness to the west. Reminders of the volcanic and glacial origin of the Caribou Wilderness can be seen throughout this forested plateau. The forest is composed predominantly of lodgepole pine sprinkled with a mixture of Jeffrey pine, white and red fir, western white pine, and hemlock. Crater peaks, cinder cones, and numerous depressions have filled with water to become splendid timber-fringed lakes. The larger lakes support brook and rainbow trout, and black-tailed deer and black bears grace the Wilderness alongside squirrels, chipmunks, and the protected pine marten. You may see bald eagles and ospreys overhead, and mergansers and grebes on the ponds and lakes. Some of the water, percolating up through the porous volcanic aquifer, forms the head of the Susan River, a major water source for the eastern slope of the Cascade Mountains. 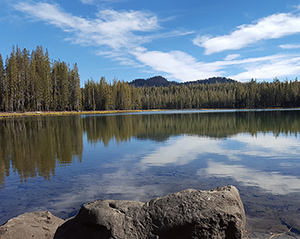 On the western border, which is shared by Lassen Volcanic National Park, stands Red Cinder, the area's highest point at 8,375 feet. From this high place, and from the tops of Black Cinder Rock and North and South Caribou Peaks, you'll find terrific views of the towering mountains that surround the Wilderness. A well-maintained trail system offers access along relatively easy slopes, but off the trails, the land is often rough and broken. Lakes are usually frozen well into June. Summer on the trails brings dashes of wildflower color and thick clusters of water lilies on the ponds--not to mention clouds of devilish mosquitoes. From Silver Lake, just outside the eastern boundary, the Caribou Lake Trail enters the Wilderness for approximately one mile, to split south about six miles to the Hay Meadows Trailhead, and north about four miles to the Cone Lake Trailhead. At Triangle Lake on the north trail, a path travels west about one mile before entering the national park. Receiving moderate human use, this area offers a chance for wondrous solitude. Planning to Visit the Caribou Wilderness? How to follow the seven standard Leave No Trace principles differs in different parts of the country (desert vs. Rocky Mountains). Click on any of the principles listed below to learn more about how they apply in the Caribou Wilderness.